The central government has met its budget fiscal deficit target of 3.5 percent for 2016-17, official data showed on Wednesday. 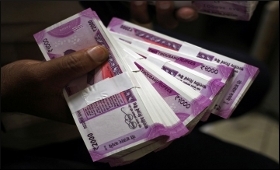 According to figures released by Controller General of Accounts (CGA), the fiscal deficit -- the difference between revenue and expenditure -- for the last financial year slightly exceeded the budgeted target to reach Rs 5.35 lakh crore as against the estimates of Rs 5.34 lakh crore. The fiscal deficit target for the last fiscal was pegged at 3.5 percent, while that for 2017-18 has been set at 3.2 percent. The exchequer's total receipts during the fiscal under review yielded Rs 14.39 lakh crore, or 97.3 percent of the estimates. The total expenditure during the April-March 2016-17 period was Rs 19.74 lakh crore, or 98 percent of the entire fiscal's estimate. On a monthly basis, the fiscal deficit in April 2017 touched Rs 2.05 lakh crore or 37.6 percent of Budget estimates for 2017-18. As per the CGA figures, the 2017-18 deficit has been pegged at Rs 5.46 lakh crore, as compared to the deficit of Rs 5.34 lakh crore for the last fiscal. The total receipts during the month under review was Rs 36,529 crore, or 2.3 percent of the estimates, whereas the total expenditure was Rs 2.42 lakh crore, or 11.3 percent of the entire fiscal's estimate. The revenue deficit during last month was Rs 1.78 lakh crore, or 55.4 percent of the estimates.